This entry was posted in Help, I'm Stuck and tagged beliefs, desire, desires, emotions, false desires, false self, fulfillment of desires, God, LETTING GO, Success, true desires, True Self. Hi Cathy!! I need to catch up reading your articles, I have been visiting my family abroad. I love this article, It is true, our emotions tell us what we really want. And I like how you explained it in simple terms. Very useful in those times when I need an oracle so to speak. Glad you’re back home again. This was good! 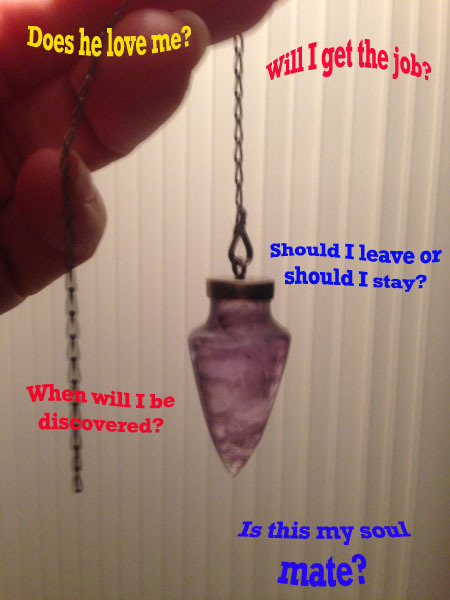 I could relate to the dowsing thing. I learned how to dowse last year and thought I was super cool too. I also noticed that I was hoping for one answer whenever I asked a question. It kind of reminds me of that decision making trick: Toss a coin up in the air. Call heads or tails. Notice what you were hoping for while the coin was in the air. There’s your answer! What about situations where neither side seems clear and peaceful? To use your example in the photo, what if someone feels anxiety at the thought of staying AND going? I’ll try to break it down myself. The next thing to do would be to feel the anxiety after choice number 1 and pay attention to the thoughts going through the mind. Let them go. Let them go. ETC. Do the same with choice number 2, until one choice feels calm. Yep you got it right Ashley. Whenever we don’t know which is the answer, there are beliefs in the way. We clear those, and then one decision is calm and that is the one. Doesn’t mean it will be problem free, but it will be the quickest route to freedom. So we’ll meet whatever we need to clear to get there.